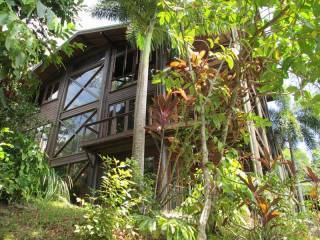 Cow Bay Homestay B&B offers comfortable bed and breakfast accommodation 2 hours drive north of Cairns, in Far North Queensland, Australia, in the heart of the World Heritage Daintree Rainforest. Our B&B is located half way between the Daintree River and Cape Tribulation, off the main tourist route, and only 1.5 km from Cow Bay Beach. 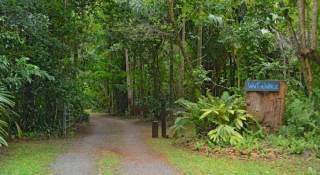 This location of Cow Bay Homestay provides easy access to all the activities in the Daintree-Cow Bay-Cape Tribulation area, and the Daintree National Park. 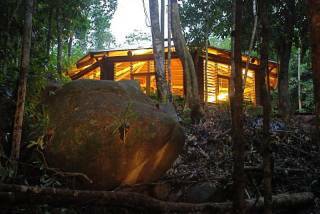 The tropical pole home of Cow Bay Homestay will show you how to live comfortably in the Wet Tropics of the Daintree, this remote corner of Far North Queensland. 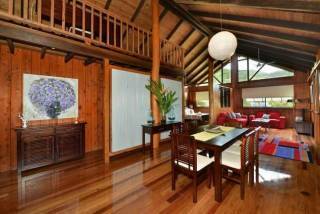 The house provides views to the Alexandra Range and the hills of Daintree National Park. The house is powered by solar energy and guests are welcomed to experience a more sustainable lifestyle. Cow Bay Homestay is 15 minutes walk away from Cow Bay Beach, with its three palm fringed bays and beautiful inshore reefs. This beach is one of the beautiful and remote beaches in the Daintree area. The Daintree is the only area, where two World Heritage Areas meet: the Daintree Rainforest and the Great Barrier Reef. This is easily observed during a walk on Cow Bay Beach, where the Rainforest really does meet the Reef! Cow Bay Homestay is situated on the Daintree Coast, which offers visitors a big range of activities, diving, snorkeling on the reef, swimming in the creeks, surfing through the jungle on zip lines, walking in the forest, expeditions to remote islands by kayak, tasting exotic fruits and ice creams, dining in outstanding restaurants and cafes, guided walks to receive expert local insight into the amazing flora and fauna, watching crocodiles during river cruises and lots more. Then there are fantastic birds and butterflies and the amazing cassowary. Here you find the place and time to see, feel, smell; immerse yourself in your own relaxed way. This room contains a Queen bed and single/daybed, a spacious ensuite bathroom and veranda, shared use of the of deck, all linen and towels provided, daily room service, louvered windows, and breakfast included. This room contains a Queensize bed, spacious ensuite bathroom and veranda, shared use of the of deck, all linen and towels provided, daily room service, louvered windows, and breakfast included. The area north of the Daintree River does not have mains power. Small accommodation places like us have solar, batteries and a backup generator; bigger resorts have generators only. There is no street lighting here and you will need a flashlight/torch/mobile phone to find your way to the restaurant at night time, and back to your car !. We do have plenty of water and it is very good quality, so fill up your bottles any time. We do pump the water into the house and this requires power. Please do not use a hair dryer /straightener or other items, which create heat, it will trip the power supply immediately! Charging your batteries is fine. The golden rule is: turn on only what you use. We do have ceiling fans and during summer air conditioners in the bed rooms. Our house is designed for the tropical climate and it is comfortable. We do provide you with doonas in winter; it can become rather cool during the night. The windows are screened and you can adjust the louvers for cross breezes. Full payment at time of booking. No refund, if cancelled 72 hours before arrival. $ 100.00 service charge for any cancellations. Cow Bay Homestay B&B is located 2 hours’ drive, approx. 120km north of Cairns. Follow the signs out of Cairns to Port Douglas/Mossman. Once you are past Palm Cove the road winds very prettily along beaches offering spectacular views to the Coral Sea, Islands and fringing reefs. Please take note of the number of pull off bays, to let faster traffic go past. Drive past Port Douglas and through Mossman. Mossman is the commercial town of this area and still keeps the charming character of a small Queensland town. Drive north towards Cape Tribulation and after ca 30minutes there is the turn off to the Daintree River Ferry/ Cape Tribulation. The ferry runs continuously from 6 am to midnight, and the ticket can be purchased at the booth. Only cash after 5 pm!!! After leaving the ferry you enter the green of the Rainforest. The road becomes very windy and offers a great view of the numerous tall trees and vines. After crossing the Alexandra Range, approx. 15 minutes, you come into Cow Bay. Turn right to Cow Bay Beach. This is Buchanan Creek Road. After5 km you find the turn off to Wattle Close on the right side of the road. Cow Bay Beach is approx. 800mtr down the road. Our sign “Cow Bay Homestay B&B” is on the entry to the property, left site of Wattle Close. Take is slow in the driveway. The parking area is left and the house is on the right side of the car park.